Although it may increase risk factors, being stricken with heart disease does not necessarily mean a woman cannot have a safe pregnancy and deliver a healthy child. The heart and cardiovascular system of a pregnant woman are under greater strain than those pre-pregnancy counterparts. The added weight and the need for the heart to pump oxygenated blood to two living beings demands that the organs work harder. This added pressure can, at times, exacerbate a pre-existing problem or precipitate a new one in susceptible individuals. Several specific types of heart and cardiovascular illnesses may pose potential risks and complications to a pregnant woman and her growing fetus. In these instances, precautionary measures can be employed to increase pregnancy safety and reduce the risks to both expecting mothers and their unborn children. Obstetricians, cardiologists and family physicians caution women with any form of heart or cardiovascular troubles to exercise extreme caution and, if their condition is severe enough, avoid pregnancy altogether. Specific conditions can pose different degrees of danger and might also be worsened by factors such as the woman’s age, additional health issues and the severity of the heart or cardiovascular ailment present. That said, pregnancy may not be entirely out of the question for many women dealing with heart diseases. It is possible for pregnant women with certain relatively common conditions to have a safe pregnancy and deliver a healthy newborn. 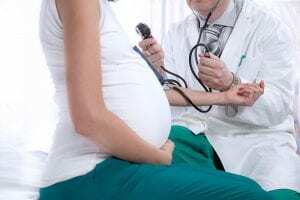 High blood pressure, medically known as hypertension can either be pre-existing or brought on by pregnancy itself (a condition called to preeclampsia) in expecting women. Though high blood pressure is not always a serious concern for pregnant women, uncontrolled hypertension could pose threats to their unborn children such as stunted growth, premature birth and premature placental separation from the uterus. For the mother, uncontrolled hypertension could precipitate various forms of heart problems or worsen any undiagnosed or asymptomatic condition. Stricken women may be able to regulate high blood pressure through lifestyle changes such as improved diet, engaging in appropriate exercise, greatly limiting alcohol consumption and the cessation of smoking. When more severe manifestations are present, anti-hypertensive medications might be indicated. However, certain medications might contraindicate pregnancy. Therefore, a drug regiment should be closely monitored by a doctor. This ailment occurs when blood vessels in and surrounding the heart become occluded by cholesterol deposits. Should the condition progress significantly, the woman in question might be at greater risk of suffering a heart attack or stroke. Treatment protocols could be geared towards lowering blood concentrations of cholesterol through the use of medications or via diet and exercise. If the malady is severe enough, a doctor might place an impacted woman on an aspirin regiment designed towards thinning the blood which would enable blood to flow through clogged arteries with greater ease and prevent the development of potentially dangerous blood clots. Heart valve problems might interfere with the organ’s ability to pump blood properly and should such issues progress far enough, may precipitate congestive heart failure. Congestive heart failure often involves fluid collecting in the heart and enlargement of the organ and can manifest in symptoms such as fatigue and shortness of breath. Pregnant women would not likely be candidates for surgery during their pregnancies. However, doctors could monitor the progression of their illness through cardiograms and treat any symptoms accordingly. A women stricken with heart disease has only fought half the battle by making it through her pregnancy. The stress of the birthing and delivery process could also pose health risks for both mother and unborn child. Medical professionals suggest women with a heart ailment or high blood pressure plan to give birth at a medical facility equipped to handle such circumstances and employ a team of professionals experienced in handling their specific situations. Other physicians suggest that all women who are pregnant or eventually plan to become pregnant receive a complete cardiovascular checkup. If a particular condition is diagnosed, it could be addressed prior to causing or exacerbating any specific problem.